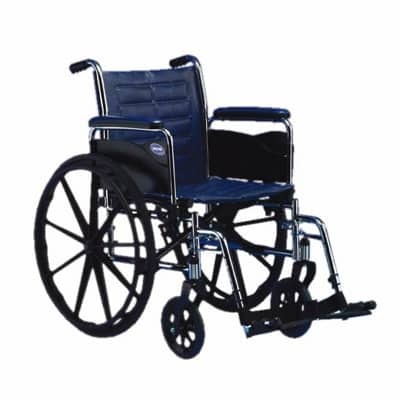 Our small wheelchairs come with adjustable length footrests, fold to fit in your car, have brakes on both sides, weighs only 36 pounds, will support up to 250 pounds, and has an 16″ wide seat. This wheelchair is exactly the same as the standard wheelchair except it has a more narrow seat. We also carry elevated leg rests for this chair which are rented separately. All Seasons Rent All does not participate in Medicare/Medicaid or any type of insurance plans. SKU: OAA04. Categories: Medical & Guest, Medical Equipment. Tags: small wheelchair, wheelchair. Elevated leg rests are used to keep a leg elevated as needed when in a wheelchair. The leg rest’s angle/height is completely adjustable and has a padded calf rest for additional support and comfort. This item is rented separately from the wheelchair itself and cannot be rented without renting a wheelchair from All Seasons Rent All. All Seasons Rent All does not participate in Medicare/Medicaid or any type of insurance plans. This shower bench is adjustable in height from 12″ to 22″ tall. All Seasons Rent All does not participate in Medicare/Medicaid or any type of insurance plans. A raised toilet seat rests on the toilet bowl to give a taller sitting toilet. This item is strictly new for sale (we don’t rent this item). We carry this for both standard round toilet bowls as well as for elongated (oval) toilet bowls. We also carry toilet safety frames to attach to your toilet which are rented separately. All Seasons Rent All does not participate in Medicare/Medicaid or any type of insurance plans. This walkabout walker weighs only 14 pounds, will hold up to 300 pounds, 6″ wheels for indoor or outdoor use, has a seat to rest in, has height adjustable handles, collapses for easy transport, and has a basket to hold all your daily essentials. All Seasons Rent All does not participate in Medicare/Medicaid or any type of insurance plans.